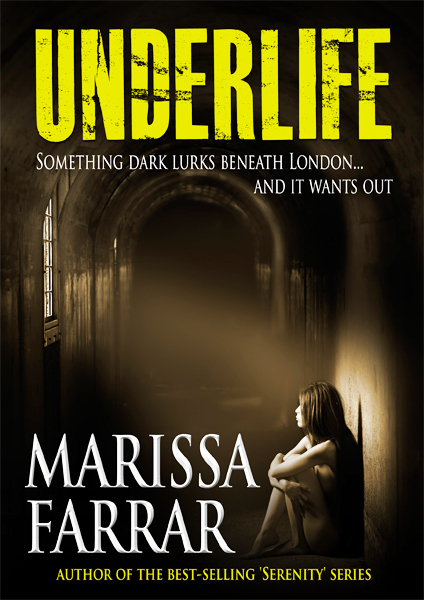 Marissa Farrar: My New Release - Underlife! My New Release - Underlife! Today is the day, folks! 'Underlife,' the novel I started three years ago, is finally available to buy. I got the idea for the novel during my years living in East London in my early twenties. On a journey on the London underground, I was waiting at a station for the next train. While waiting, I noticed someone had graffitied the wall with the words, ‘Help me.’ Straight away the thought of ‘what if that message was written for someone in particular’ came to me. What if people were trying to communicate with someone via these messages in order to tell them something? I’ve always found the London Underground to be a spooky, strange place and wanted to set a story in the location. There have been many nights when, after working until late at night, I’ve caught the last train home and have been inspired by the creepy atmosphere. Not long after seeing this message on the wall, I watched a documentary about the underground homeless in New York. Right away the two different ideas blended and the storyline for ‘Underlife’ was born. Thomas Young has no idea where he comes from. Found living on the streets as a child and put into foster care, he always dreamed of having a family of his own. Now a grown man, he has his much longed for family, but his life is tinged with sadness. His son, David, has leukaemia. One night, as he's driving home from the hospital, he hits a homeless man, Mack, with his car. Mack knows Tom from his childhood and tells Tom he was once part of London's underground homeless and his son's leukaemia is not all it seems. Underlife is available to buy from Amazon.com and Amazon.co.uk, and Smashwords. The book will be available on other sites such as Apple and Barnes & Noble very soon. And if you'd like to 'try before you buy' you can get the prequel short story, 'Go Back' together with the first few chapters of Underlife, for free from numerous ebook stores such as Smashwords, Kobo, Barnes & Noble (currently still $0.99 on Amazon). In other news, I know the majority of you are eagerly awaiting the publication of the next ‘Serenity’ book, ‘Dominion’. I’m thrilled to tell you that the first chapters have been sent off to my editor today, so the book is well on track for its predicted release at the end of October. Enjoy everyone! I'm off to crack open a beer to celebrate! Congratulations on your newest release, M. I started doing a little something to help promo the works of my pals, so you'll find your cover on my site for a few weeks. As always, wishing you continued success with your writing. Thanks so much Jimmy! I really appreciate the support!